We’re following a size theme with our posts this month and today we’re going to highlight how to properly pick the right size vanity mirror. If you’ve been following, you know our size posts begin the same way: measure your space. The vanity mirror has the same beginning, but instead of measuring along the floor, you want to measure the vertical space you have to place your mirror. Begin by drawing a rectangle on graph paper, the size of the wall your mirror will be mounted on. You’ll need the length of the wall and the height, floor to ceiling. Remember to use the squares on the graph paper to keep your scale. Depending on the size of your wall, you may have to adjust, but you can start with trying one block per inch you measure. Next, draw another rectangle that is the size and location of your vanity onto your wall. This is called creating an elevation. 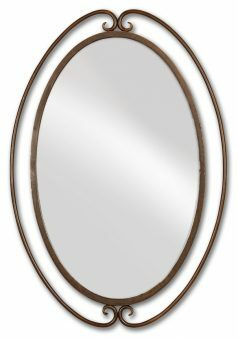 Drawing it out will allow you to visualize what different shaped mirrors will look like before you purchase. Very handy, I know. If you have vessel sinks, be sure to draw those in as best as you can using their dimensions. Mostly, you want to know where the top of the bowls are. Usually, you do not want the mirror below the level of the sink. You’ll only splash water on it constantly. Use another piece of graph paper to draw the mirrors you are considering. Cut out the shapes, be it rectangles or ovals, and place them on your wall elevation. Now you can slide the pieces around to get a preview of your new unique framed bathroom mirror! The vanity size that you measured will determine the size of the mirror. 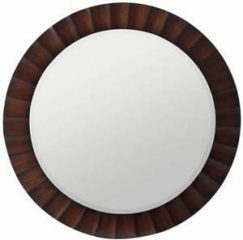 The mirror should never extend beyond the vanity over which it is hung, otherwise it will look top-heavy. Hanging a mirror the size of your vanity gives a nice clean, uniform look. You can also choose to place a mirror just over the sink, which looks especially classy in bathrooms with his and her sinks. In this instance, the mirror can project beyond the dimensions of the sink bowl, as long as it is still in proportion with the vanity.